Dania and Majid are a beautiful and passionate couple from Jiddah, Saudi Arabia. 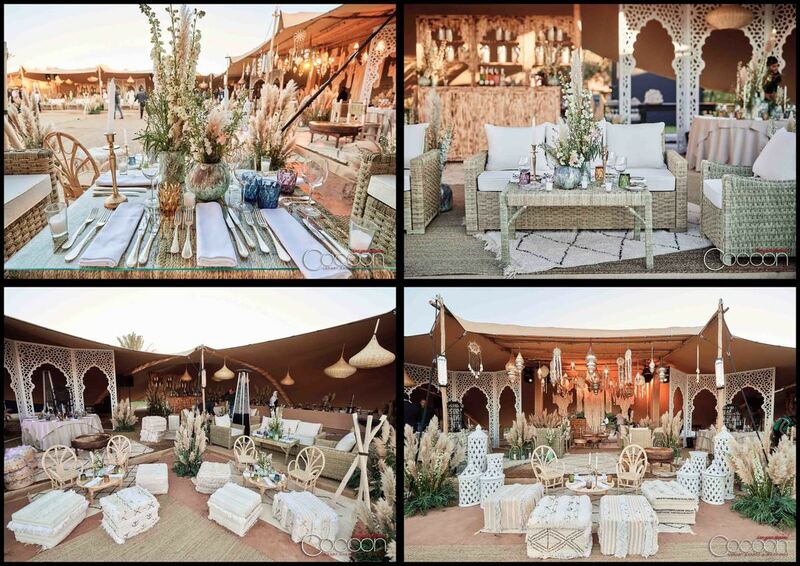 Their shared love of horses and exotic destinations inspired their decision to hold their Luxury wedding in Morocco. 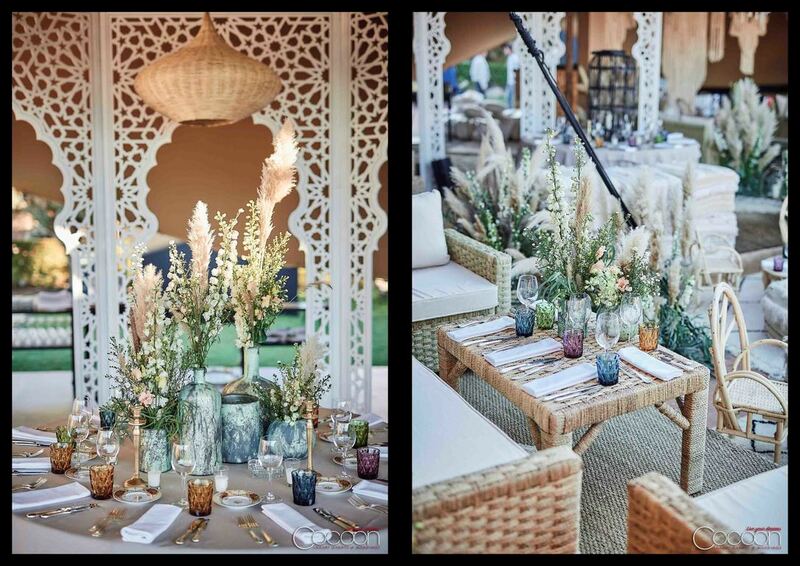 As their wedding planner in Marrakech, we embarked with Dania and Majid (and their 400 guests!) 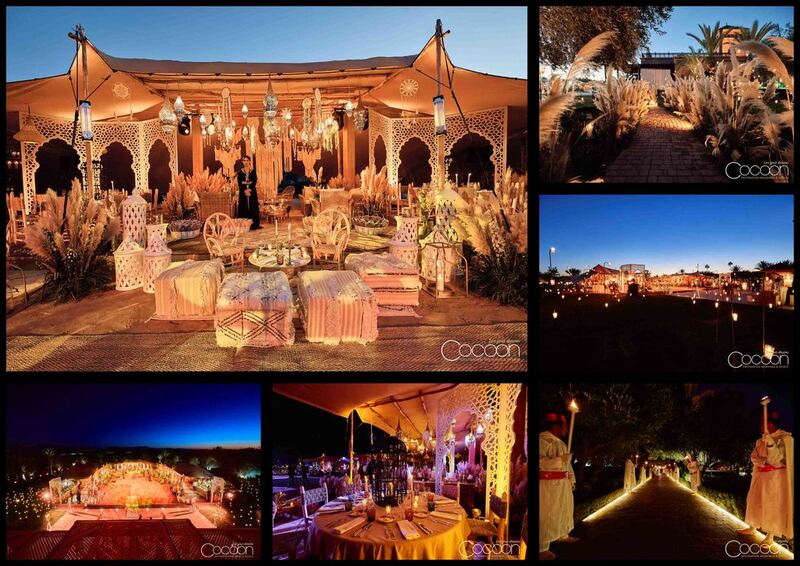 on an emotional journey bringing to life their dreams and creating the ultimate Moroccan wedding adventure. We began with a welcome night in traditional Moroccan style at the Hotel Palais Selman. Dania wore a caftan and was presented to her guests upon her arrival in an amaria, an elevated platform with a roof that is customarily borne by four strong men. The floral design and décor for the welcome event were locally inspired, offering guests an introduction to Moroccan culture. 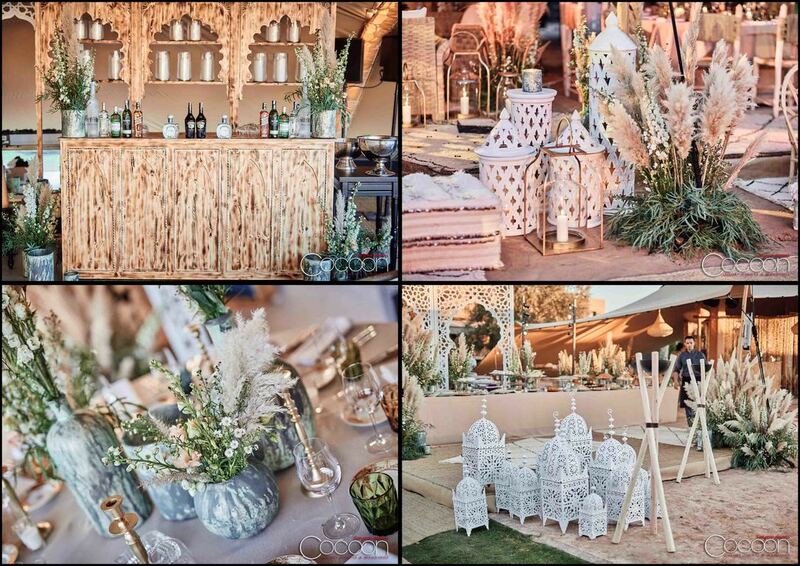 On the second day, we planned a 1001-Nights party for more than 250 guests who had traveled to Morocco to celebrate Dania and Majid’s designed by destination wedding planner. 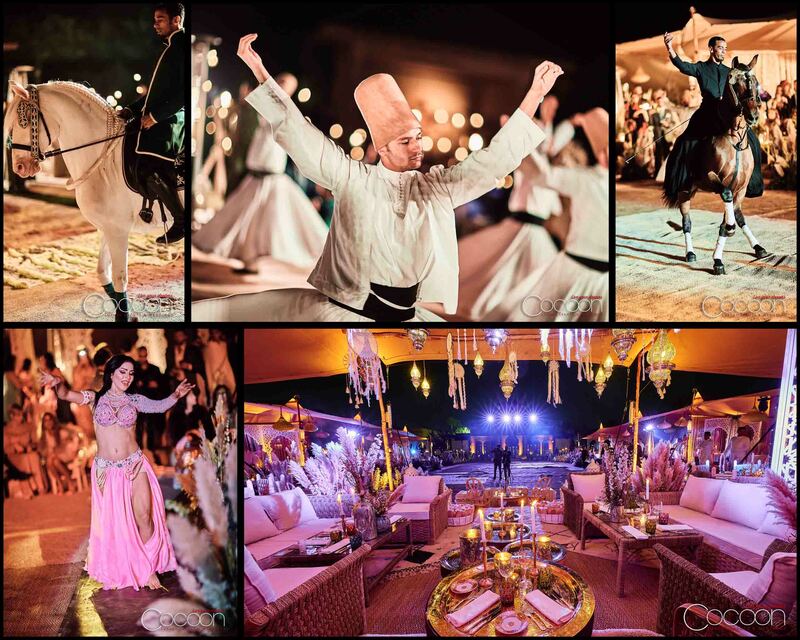 The theme was Bohemian Chic and the entertainment included authentic Turkish dancers, Egyptian belly dancers and a crowd-pleasing Moroccan horse performance. Dinner was a delicious buffet prepared by the chef from the Selman hotel, featuring a wide variety of gourmet foods and desserts. As the evening grew chilly the of wedding planner in Marrakech, offered the ladies capes and dancing shoes so they might continue to enjoy the party in comfort and style. 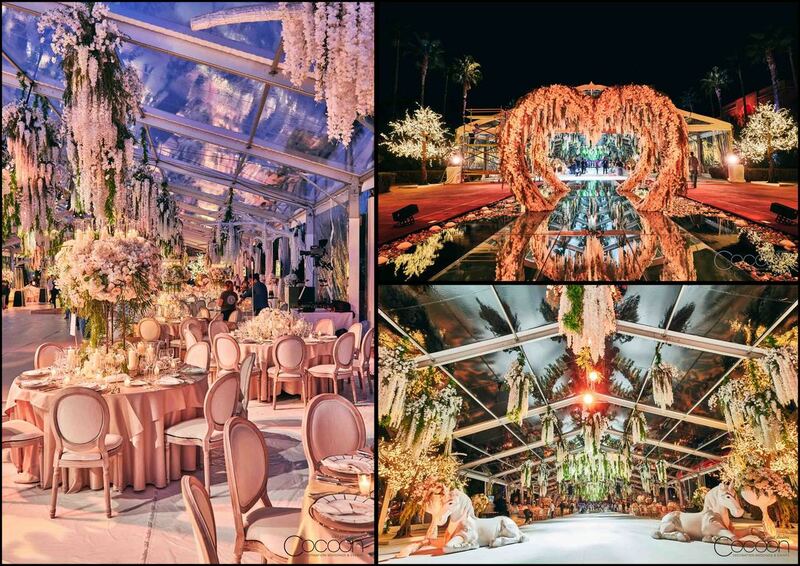 For the main event, we erected a marquee tent for 400 guests, which we decorated with incredible floral work designed by our talented partner from the south of France, Nicholas Barrelier. The bride and groom were accompanied by 15 authentically dressed Moroccan dancers with drums as they made their dramatic entrance into the event. 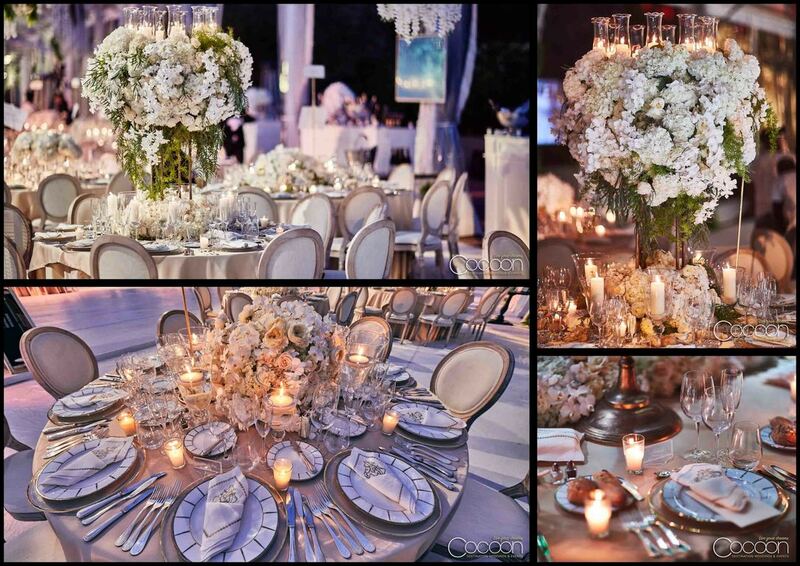 Their wedding cake was 5 meters high and accented with perfect gold and silver pearls. 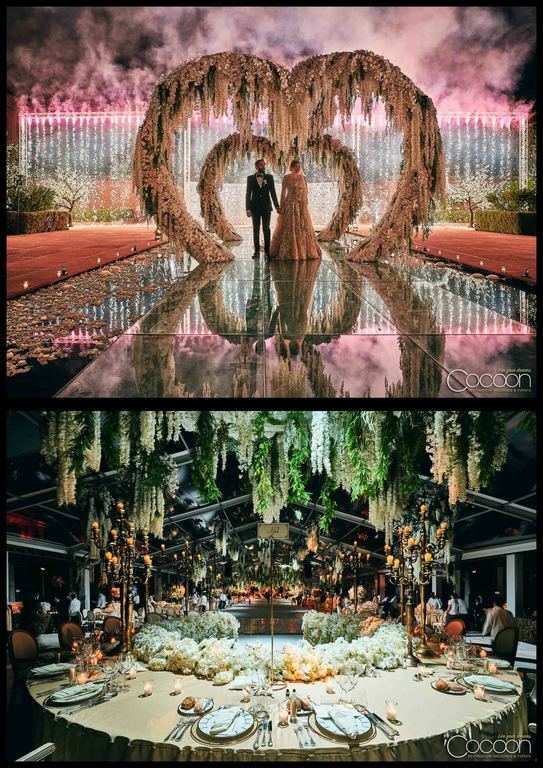 We illuminated the ballroom with hundreds of glowing candles, and guests were entertained by an international cast from London, Paris and Bahrain. It was an honor to interpret Dania and Majid’s hopes and dreams on such a massive scale in some of Morocco’s most beautiful locations. We wish the newlyweds a lifetime of happiness worthy of their extraordinary and romantic destination wedding in Marrakech.